Clothing/Jewelry Description A plain cream-colored shirt with three-quarter length sleeves and a scoop neck, black leggings or capri pants, and flip-flops. Carrying a black, yellow, gray and white Vera Bradley with a shoulder strap. A photo of Vibert on the night of her disappearance is posted with this case summary. Distinguishing Characteristics Caucasian female. Brown/red hair, brown eyes. Vibert has the following tattoos: the word "Family" on the upper right side of her back with the words "Strength", "Pride", "Loyalty", "Honor" and "Love" around it in a circle, a Mad Hatter on the front of her right shoulder, the name "Savannah" on one wrist, the name "Maddox" on the other wrist, and a skeleton key on her right foot. Her ears and nose are pierced, and she has recent deep cuts to the inside of her right forearm. A photo of Vibert's "Family" tattoo is posted with this case summary. Vibert was last seen at a Marathon Gas Station on Miller Road in Flint Township, Michigan on July 17, 2017. 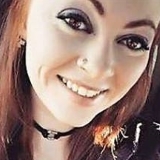 She got into a red Pontiac Aztek driven by an African-American male at approximately 1:00 a.m.
After her disappearance, the man contacted police and cooperated with the investigation; he has not been named as a suspect in her case. She may have been seen talking to someone in a green or teal Ford Ranger S-10 pickup truck in the gas station parking lot, but this has not been confirmed. After her disappearance, her bag was found in a ditch near her home. Her phone had been left behind in the red Aztek. Vibert left behind four children. She had gotten divorced shortly before her disappearance and had a rocky relationship with both her ex-husband and her new boyfriend. Her mother stated she maintained regular contact with her family, however, and seemed happy. Investigators are not sure whether she is voluntarily missing. Her case remains unsolved. Updated 2 times since October 12, 2004. Last updated February 3, 2019; picture added, details of disappearance updated.